There are some so-called Vaişņavas who hate Bhagavatī Kālikā with venomous intensity and hence attempt has to discredit Bhagavatī Kālikā as the deity of Devī Sūktam and falsely attribute it to Śrī Rādhikā; and because it was seen that other than Durgā Saptaśatī the idea of Devī elucidated in Devī Sūktam also resonates with Śrīmad Devī Bhāgavata Mahāpurāņa, this time these pseudo-Vaişņavas have tried to hijack Devī Bhāgavatam as well. The abode of Mūlaprakřti is known as Maņidvīpa; it is the highest abode, higher than Mahākailāsa, Goloka and Vaikuņțha. It is surrounded by Sudhā Samudra and has nine well guarded enclosures (Śrīcakra) made of gems. Mūlaprakřti sits on a throne known as Pancapretāsana or Śivākāra, which consists of Brahmā, Vişņu, Rudra & Maheśvara as legs and Sadāśiva as plank. Mūlaprakřti is also known as Śrīmat Bhuvaneśvarī. Mūlaprakřti has four arms, three eyes and a complexion that can be white, red or black; She holds a noose & a goad with two hands while displaying Abhaya & Varadā Mudrās. Her ear ornaments bear the design of Śrīcakra, She annoints Herself with red sandalwood paste, and wears red vestments. Mūlaprakřti is attended by eight Śaktis lead by Anańgakusumā; She is a Mahāvidyā, Prakřti and mother of Mahāvişņu. As an infant He saw Mūlaprakřti craddling Him amidst the cosmic ocean. Mūlaprakřti is known as Bhavānī, Śivā and Durgā. Mūlaprakřti incarnated as Pārvatī, the daughter of Himācala. Mūlaprakřti is responsible for the death of Madhu & Kaițabha. Mūlaprakřti is responsible for Hayagrīva’s death. Mūlaprakřti is indistinct from Puruşa; She is Puruşa and Puruşa is Her. Essentially She is not male, female or hermaphrodite; but it is She who becomes all these. Mūlaprakřti’s forms are the Mātřkās. Mūlaprakřti is responsible for Vřtrāsura’s death. Mūlaprakřti incarnated as daughter of Nańdagopa. Mūlaprakřti is Brahman and Mahāmāyā; she is Nirguņa but becomes Saguņa by resorting to Her own Māyā. Mūlaprakřti is Prakřti of Sāńkhya, Vimarśa of Śaiva Tańtras and Avidyā of Vedāńtā. Mūlaprakřti is denoted by Māyābīja or Śaktibīja “Hrīm”. Mūlaprakřti’s highest pilgrimage is the Yonīmaņđala of Kāmākhyā Śaktipīțha. Mūlaprakřti’s favourite festivals are Caitra and Śāradīya Navarātrī. Mūlaprakřti gets appeased when Devī Sūktam and Devī Atharvaśīrşam are sung in Her honour. Mūlaprakřti is appeased when Kumārīs are worshiped as Her living image. Mūlaprakřti is worshiped with the Nyāsa of Hrīm Bīja alias Hrīlekhā, the Tańtrokta Praņava. Mūlaprakřti gives place in Her abode Maņidvīpa to those who worship Her. Mūlaprakřti slew Dānava Mahişāsura and his army. After slaying Mahişāsura, Durgā went back to Maņidvīpa, the abode of Mūlaprakřti. Mūlaprakřti slew Śumbha, Niśumbha and other Daityas. Mūlaprakřti five forms known as Pańcaprakřtis; they are Durgā (Pārvatī), Rādhā, Lakşmī and Sarasvatī. Among these five, Pārvatī is the direct manifestation of Mūlaprakřti; She is Śakti of Śiva, mother of Gaņeşa and presiding deity of Křşņa’s intellect. She always resides with Křşņa and has manifested from the left half of His body. Mūlaprakřti is Pārvatī. She is sleep, hunger, thirst, etc. ; all of which are mentioned in Aparājitā Stuti (Tańtrokta Devī Sūktam) from the 5th chapter of Durgā Saptaśatī. This hymn was sung by Devas to appease Durgā for vanquishing Śumbha and Niśumbha. While waging war against Śumbha’s commanders Caņđa & Muņda, Mūlaprakřti Kauşikī (Durgā) projected Cāmuņđā Mātřkā from Her forehead. Mūlaprakřti Durgā was propitiated by Sūratha and Rāmacańdra. Mūlaprakřti first incarnated as Satī, the daughter of Dakşā; later She incarnated as Pārvatī, the daughter of Himācala. Mūlaprakřti was impregnated by Křşņa, after which She gave birth to an egg and laid it upon cosmic ocean; from this egg was born Mahāvişņu. Mūlaprakřti’s direct manifestation is Durgā, who appeared out of nowhere; She has three eyes & thousand arms, She is Brahman, source of all Śaktis and all Devīs are born of Her parts. Křşņa gave Her a throne to sit on. Mūlaprakřti is Brahman and during Prākřtik Pralaya Trimūrti and seers etc merge into Her. Mūlaprakřti is Brahman and it is She who resides in Goloka as Křşņa, in Kailāśa as Śiva and in Vaikuņțha as Nārāyaņa. Mūlaprakřti is Brahman and by worshiping Her that Pārvatī has become Mahāmāyā & appeared from left half of Křşņa and by worshiping Mūlaprakřti Rādhā has become wife of Křşņa. Křşņa attained His position in Goloka by propitiating Mūlaprakřti. Worshipers of Devī Mańtra go to Mūlaprakřti Śrīmat Bhuvaneśvarī’s abode Maņidvīpa. Mūlaprakřti is propitiated during Śāradīya Navarātrī with animal sacrifice; those who do so go to Śivaloka and remain in service of Śiva-Pārvatī. When Sāvitrī requestes Yama to initiate her into the root Mańtra of Mūlaprakřti, Dharmarāja gave her the Mańtra of Śrīmat Bhuvaneśvarī. Mūlaprakřti created Gopālasuńdarī, who is Křşņa. Mūlaprakřti Durgā merges in Křşņa and Křşņa merges in Mūlaprakřti Śrīmat Bhuvaneśvarī, who is Nirguņa Puruşa and Jnāna Śakti. Sāvitrī and Satyavāna went to Maņidvīpa upon death because they worshiped Mūlaprakřti with Bhuvaneśvarī Mańtra. Mūlaprakřti Pārvatī (Durgā) is Śāmbhavi Śakti Mańgalacaņđikā (Lalitākāńtā, one of the Pīțhaśaktis of Kāmākhyā Śaktipīțha); it is by Her energy that Mahādeva slew Tripura. Mūlaprakřti is Śāmbhavi Śakti and is also propitiated via Navārņa Mańtra; deities of this Mańtra are three Ańgavidyās of Navārņa Caņđikā- Mahākālī, Mahālakşmī and Mahāsarasvatī. Paurāņik mode of worshiping Mūlaprakřti Durgā is adopted from Vaikřtik Rahasya of Mārkaņđeya Purāņa. Mūlaprakřti gets pleased on recital of Durgā Saptaśatī. Before reading the 9th Canto (favourite of Vaişņavas) of Devī Bhāgavatam, the Sańkalpa is to be made in the name of Mūlaprakřti Durgā. Mahāvidyās (Kālikā, Nīlasarasvatī, Ugratārā, Mahogrā, Tripurasuńdarī, Bagalā, Bhairavī, Mātańgī, Dhūmāvatī & Pracaņđacaņđikā) and Pańcadurgās (Nańdajā, Raktadańtikā, Bhīmā, Śākambharī & Bhrāmarī) are incarnations of Mūlaprakřti Śrīmat Bhuvaneśvarī. Mūlaprakřti rewards those with place in Her abode Maņidvīpa, who bathe Her with grape juice. Mūlaprakřti likes red sandalwood paste (forbidden in Vaişņavism). Mūlaprakřti loves offerings of Bilva leaves (forbidden in Vaişņavism), especially those on which Bhuvaneśvarī Mańtra has been written with red sandalwood paste. Mūlaprakřti’s Homa is performed in a triangular Kuņđa, in which the Kuņđa represent’s Devī’s Yonī and fire represents Śiva’s Vīrya. Together these two represent ‘Ardhanārīśvara’ or ‘Kāmakalā’. Mūlaprakřti is pleased when Sańdhyā Vańdanā is performed and Gāyatrī is propitiated. Mūlaprakřti is Umā Haimavatī of Īśopaņişat and She humbled the pride of Ińdra and other Devas by imparting Brahmavidyā upon them. Mūlaprakřti is Śrīmat Bhuvaneśvarī, also goes by the names Umā, Pārvatī, Maheśvarī and Bhagavatī. Śrīmat Bhuvaneśvarī is Brahman, the shelter of Māyā, source of Brahmajyoti and the subject elucidated in all Vedas & Upaņişats. Śrīmat Bhuvaneśvarī’s two aspects are Brahman & Māyā, who are represented by Praņava (Om) and Hrīlekhā (Hrīm) respectively. Śrīmat Bhuvaneśvarī is Śaktimatī and Mahāmāyā (Durgā) is Her Śakti; there is no difference between the two like moon and moonlight. Hence, Śrīmat Bhuvaneśvarī Herself is Puruşa and again She as Māyā is Mūlaprakřti. Śrīmat Bhuvaneśvarī transcends the three Guņas and is thus Turīya; It is She who appointed all deities and they perform their respective duties out of Her fear. Her nature is Sadcidānańda. Primary forms of all deities reside in the outer enclosures of Maņidvīpa and indulge themselves in the worship of Śrīmat Bhuvaneśvarī. Śrīmat Bhuvaneśvarī’s quarters are in the enclosure made of Gomeda gem, where Her eight Śaktis are always employed in Her service. In the enclosure made of diamonds reside all incarnations of Śrīmat Bhuvaneśvarī. Śrīmat Bhuvaneśvarī enjoys singing & dancing in Śřńgāra Maņđapa, liberates Jīvas in Mukti Maņđapa, imparts discourses on knowledge in Jnāna Maņđapa and holds Her court with Her courteriers in Ekāńta Maņđapa. Śrīmat Bhuvaneśvarī’s palace is Cińtāmaņigřha, where on the Pańcapretāsana sits Ādipuruşa Śrīmān Bhuvaneśvara Mahādeva. He has five three-eyed faces, four arms and white complexion. He holds a trident & an axe while displaying Abhaya & Varadā Mudras. On His left thigh sits Śrīmat Bhuvaneśvarī; before creation Brahman Mūlaprakřti split Itself into two and became Bhuvaneśvara Mahādeva from right half and Śrīmat Bhuvaneśvarī from left half. In the great hall of Cińtāmaņigřha, the attendants of Bhagavān and Bhagavatī are always busy in their service. The opluence of Maņidvīpa puts Śivaloka, Goloka and Vaikuņțha to shame. From the above review of Śrīmad Devī Bhāgavata Mahāpurāņa it is clear that Mūlaprakřti and Brahman of this text is Śrīmat Bhuvaneśvarī only; while Durgā, Rādhā, Lakşmī, Sarasvatī, Sāvitrī, Brahmā, Vişņu, Rudra, Křşņa and Bhuvaneśvara Mahādeva are the forms assumed by Her and are indistinct from Śrīmat Bhuvaneśvarī. She has no overlord of Her, as She is Svādhīnavallabhā. Śrīmad Devī Bhāgavata Mahāpurāņa too is a Pańcayātana Śāstra, where the glories of Gaņapati, Śiva, Śakti, Hari and Sūrya have been sung. A lay episose cherry picked from a particular section of a text doesn’t change the absolute truth promulgated by the rest of the text. 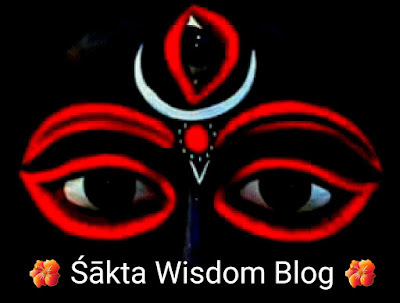 It is being implied that since Śiva “worships” Śańkarşaņa hence Hara is inferior to Hari. In response I would like to say that the concerned chapter from the 10th Canto clearly states that it is “Rudra Deva” who meditates upon Śańkarşaņa and Śrīmat Bhuvaneśvarī. It seems that the haters of Bhagavatī Kālikā have forgotten that there exist Turīya Śivas other than Mahārudra, who are not part of the Trimūrti. Rudra (an incarnation of Mahādeva) meditates upon Hari for doing Lokakalyāņam by setting an example. Otherwise He meditates upon His own image of Bhuvaneśvara-Bhuvaneśvarī. In response I would like to say that the concerned chapter from the 9th Canto clearly states that this “Kālī” who emerged from the forehead of Mūlaprakřti Durgā during battle against Śumbha & Niśumbha, is in reality Cāmuņđā Mātřkā, who is distinct from Devī Kālikā (Ādi Mahāvidyā). After Devī Ambikā had manifested from fair the Košas of Pārvatī, the later turned black in colour and became renowned by the name “Kālikā”. Here Cāmuņđā has been addressed as “Kālī” simply because of Her dark complexion. For the matter of fact, Cāmuņđā Devī was dark right from the moment of Her appearence; and even if we consider that She worshiped Křşņa and turned black, even then we must remember that Gopālasuńdarī is a form of Śīmat Bhuvaneśvarī alone. Here Křşņa is a medium through which Śrīmat Bhuvaneśvarī’s incarnation is manifesting as one of the Tridevīs; somewhat similar to Rudra Deva manifesting from Brahmā’s frown. Besides, the concerned chapters from 9th Canto state that Durgā manifested from the left half of Křşņa’s body, and it is only during Prākřtik Pralaya when She merges into Křşņa’s intellect. How does that prove Śrī Křşņa’s Superiority over Bhuvaneśvara Mahādeva and Śrīmat Bhuvaneśvarī? Besides, “Křşņa” before creating Tridevas is said to have mated and impregnated Mūlaprakřti Śrīmat Bhūvaneśvarī. How is it possible for chaste Mother Bhavānī to consort with someone else apart from Mahādeva? Thus, logical conclusion leads to “Křşņa” of the 1st and 2nd chapters of the 9th Canto has to be Aghora Mukha of Bhuvaneśvara Mahādeva only, who is also addressed as “Křşņa” for being black in colour, for giving Bhakti to Upāsakas and for being root cause of all. It is that Parāśiva who created Brahmā & Křşņa from His right half and Vişņu & Rudra from left half of His body. It now makes sense why Bhagavatì Durgā resides with “Křşņa” and manifested from His left half. As promised earlier, all attempts of hijacking Devī Sūktam & now Devī Bhāgavatam too will be duly addressed, and falsehood forged by hatred will be smitten down by the Khațțvāńga of truth. At most the haters of Bhagavatī Kālikā can fool the innocent by cherry-picking sellective portions of a scripture and hiding the rest of it; but what if an Angry Old Bat brandishes the entire scripture before the public? Classical example of the aforesaid situatiin is this answer; an Analysis of Devī Sūktam and A Review of Devī Bhāgavatam, which not only establishes Devī Bhāgavatam’s deity being Mūlaprakřti Śrīmat Bhuvaneśvarī but also establishes Devī Durgā as the deity of Devī Sūktam. Besides, the other Purāņas & Upaņişats that eulogise Mātā Śāmbhavī as Brahman and resonate the same idea of Ādyāśakti as Devī Sūktam and Devī Bhāgavatam, further strengthen the fact that Bhagavatī Kālikā is the deity of all Śākta scriptures.